Your taste buds will love this flavor combination! 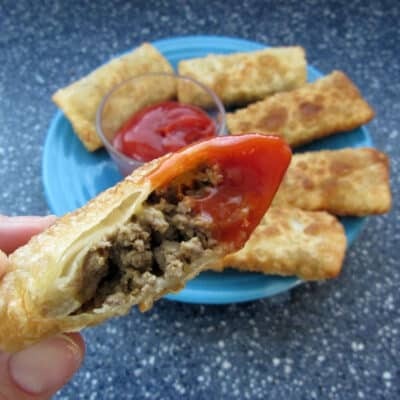 Savory cheeseburger filling surrounded by a crunchy egg roll wrapper makes a perfect snack. Fact: egg rolls are delicious. Fact: egg rolls are usually full of veggies, which means nobody in my family wants to eat them! Fact: when you cross a cheeseburger with an egg roll, you get something yummy that everyone in the family will eat. 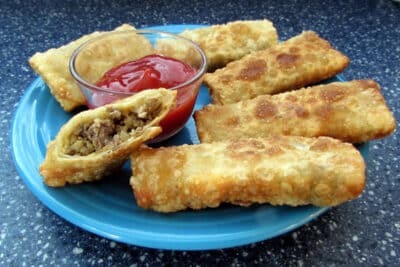 Cheeseburger egg rolls are a fun snack for after school, or while watching your favorite sport on TV. They freeze well, so you can make them ahead of time and reheat them in the oven. Don’t they look amazing? We like to serve them with regular ketchup and Sriracha ketchup. P.S. You can sneak some shredded veggies in your egg rolls and nobody will ever know. I’ll show you how. Put a teaspoon of peanut oil in a pan and saute the onions and garlic until soft. Add the hamburger and cook until browned. Drain any grease from the cooked meat. 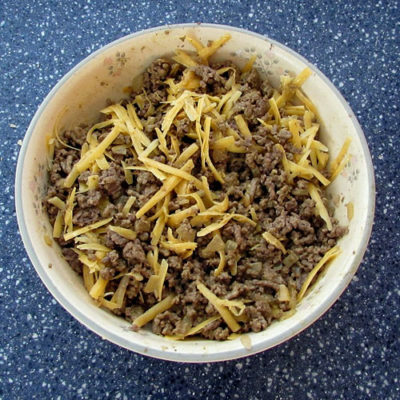 Put the meat in a bowl and mix in the cheese. Taste and see if you need to add salt or pepper. Get your egg roll wrappers out, along with a little bowl of water. Set the wrapper up like a diamond, and put 2 Tablespoons of filling in the middle. I used a regular tablespoon measuring spoon for consistency. Using a pastry brush or your finger, moisten all the edges of the wrapper. This will help seal it shut so the filling doesn’t escape while cooking. 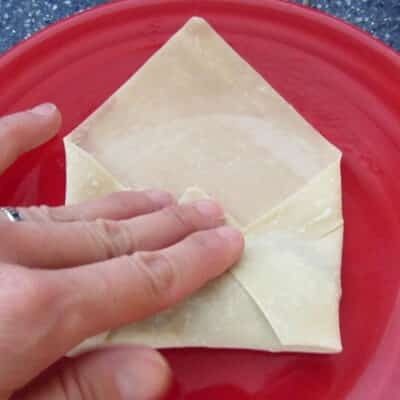 Fold the bottom corner over the filling, then fold the edges in toward the middle and press lightly. Gently roll toward the top and press gently to seal. Shazam! You’ve made an egg roll. 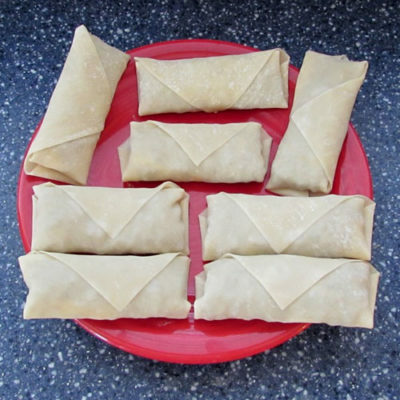 Repeat until you’ve used up all of your filling or used all of the egg roll wrappers, whichever comes first. Gently place a few egg rolls in the pan at a time (the oil will sizzle, so be careful). Cook for 1-2 minutes on each side, until they’re as brown and crispy as you’d like. Grab a bottle of ketchup and serve. We’re using peanut oil for deep frying because it has no flavor and can handle very high heat. Palm oil is another good choice. 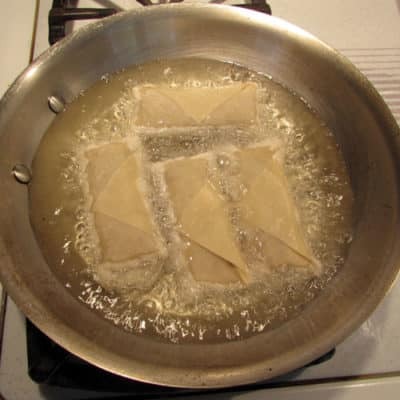 If your oil is at the proper temperature (350-375 F), the egg roll wrapper will “seal” itself when it hits the pan. It will fry in the oil but it will not absorb the oil and get soggy. This is another reason to use a good thermometer and keep the temperature of the oil stable. Chop the onions and the garlic so they’re in very small, uniform pieces. I like to use this chopper to make the job go quickly. 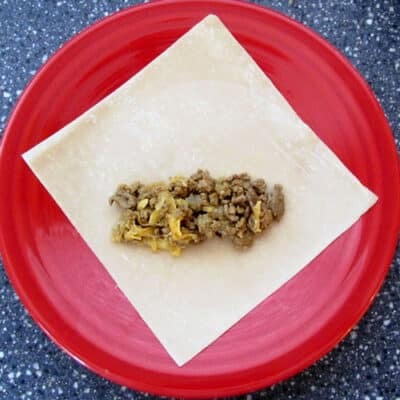 You want small pieces so you get the flavor of onions in your cheeseburger egg rolls, but not crunchy pieces of onion that your kids will freak out about. If you’re sneaking in a veggie–now is the time. Add in your vegetable of choice, along with the Worcestershire sauce and mustard. Cook for a few more minutes until the veggies are cooked through. Hopefully the veggies are starting to disappear into the meat mixture. Now it’s time to cook. 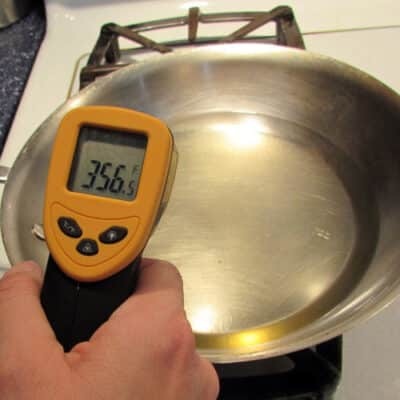 Put about half an inch of peanut oil in a pan and heat it to 350-375 F. I like to use an infrared thermometer to check the temperature, for optimal cooking and because it just looks cool. I am loving these recipes! This is what I am making tomorrow night 🙂 Looks delicious! I’m a little disheartened by your “fact” comment that no one likes to eat egg rolls because they normally contain a lot of veggies. Both my children were raised eating lots of veggies from the time they started eating solid food and as a result, they love them. 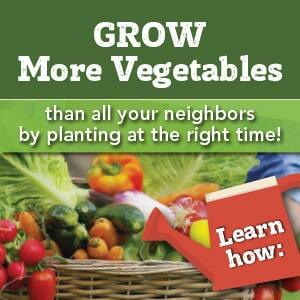 I think if you have a picky eater that particularly doesn’t like veggies, you have to sneak them in. But when you bring a child up to eat what you eat – veggies and all, and constantly introduce and reintroduce foods they may not be in love with, they become more well rounded eaters. I rarely catered to my children’s “dislikes” of certain foods – I never forced anything beyond a “taste” but I didn’t make special meals if they didn’t care for what I was making. As a result, I have two young adult children that not only eat everything, but insist on eating a healthy and varied diet.